DEBORAH CROMBIE: You have to love Jungle Red. We get to go to Paris two days in a row! Yesterday it was Paris in WWI, today it's Paris in the present. Ever wonder about the story behind the story? Here's a great one from another of my favorite writers, the terrific MARK PRYOR. Here's Mark to tell us how it all came about. DEBS: That is heartbreaking but wonderful. I'm so glad Michael Harmuth got to be in your book, and I love the locked room mystery. And the American Library is now on my must-see list next time I go to Paris. 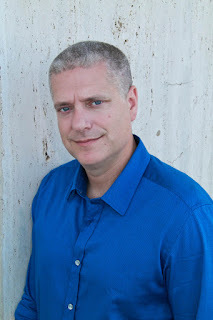 Mark grew up in Hertfordshire, England, and now lives in Austin, Texas, with his wife and three young children. He is currently an Assistant District Attorney with the Travis County DA's office. PS: The winner of Charles Todd's THE SHATTERED TREE is Bev Fontaine! Bev, email me at deb at deborahcrombie dot com and we'll get the book out to you! Michael’s story is so touching . . . I can’t wait to read the book and find out what character Michael chose. I am still chuckling over “Hello, do you mind if I kill someone in your library?” and, although I can’t think of a book I’ve read where things seemed too perfect, I think it’s really rather amazing that your library tour yielded a perfectly creepy basement complete with a tiny dying room and a secret door . . . .
That has to be the most perfect story for a writer ever told. The American Library sounds like a ready made set. Only in Paris. What a lovely story about Michael, and how wonderful that he will live on in The Paris Librarian. Now I'm sobbing about Michael and his role in your next story. What a lovely gift for him, Mark. So cool to have found a "secret" door, too. Wow..can't wait to see what role Michael plays in this one! I know Michael's family must be thrilled to see him on your pages. Such a wonderful story, Mark. And once again confirms what a stand-up guy you are. Books are so powerful, in so many different ways. Thank you for sharing this with us here this morning. Thank you for two very sweet stories… As for the too- coincidental one -- so funny! My book The Wrong Girl ( yes, it has girl in the title but it was written in 2012, OK? :-) is based on a real life incident . A woman called to say that her cousin had been sent to the wrong birth mother, as a result of a mixup and an assumption at an adoption agency: She explained that two infant girls, one named Mary and one named Marie, were born to cousins with the same last name on exactly the same day, and turned over to the adoption agency. 25 years later, when Mary was looking for her birth mother, so was the mother of Marie. Those two were matched up as mother and daughter. So as you see, the agency sent the birthmother at the wrong girl. I thought that was such a fabulous story! But in the book, I had to make it happen a different way, because the truth was way too unbelievable. Congratulations on a wonderful sounding book! And I love the cover too! No perfect settings for me, but I did have the perfect name. I offered a character named at auction for my daughter's school. The winner wanted her aunt to be the character. The aunt was an elderly Catholic lady, very devout, Who Loved Mysteries. She had a very Italian name, difficult to put into my Upstate New York series, so... I made her a nun. As it happens, having a nun in the book was what set up the entire plot. A happy turn of events! What a sweet story! I look forward to meeting the fictional Michael. It's a pleasant surprise to find out you have another book out. Since I'm on vacation and reading my way through my TBR pile,I'll make it a priority to set some others aside so I can read it as soon as I can. I love how I get so wrapped up in your mysteries that when I look up from the book to find myself in my living room instead of in the scene I'm reading, I'm surprised. And wow! A secret room! Looking forward to it! What a touching story about Michael. The story about the library though. That has me laughing. How perfect. And what a wonderful set of circumstances for a mystery author! I wonder what your librarian friends were thinking. "We could get in such trouble, but..."
No need to enter me in the drawing for the book as I won a copy from the publisher via Twitter. It's sitting on my piano. Perhaps it'll have to be next in line! Thanks everyone! You know, I get to meet Michael's brother next weekend, I'm doing a signing in his neck of the woods, in Dallas, so that'll be a treat for me. I'm gutted I didn't get to meet Michael in person, but I've been in touch with several members of his family and they are all wonderful people. I feel lucky that Sarah reached out to me. As for the whereabouts of the American Library, I'm not surprised you missed it, Ann, it's not the gran structure it deserves to be. The address is 10 Rue du Général Camou, which is a stone's throw from the Eiffel Tower, maybe one block away. Thank you so much for hosting me, JRW, I'm a loyal fan of yours and am honored to appear amongst you. Oh, and hope to see you all in New Orleans! Mark, what's up next for Hugo? Mark, it's on my nightstand too. Can't wait to finish the book I'm writing so that I can read again. And now I must visit the American library next time I'm in Paris. A secret door? Perfect. What a sweet, wonderful story about Michael, Mark. It speaks volumes about how important that connection between reader and author is, and your compassionate nature shines through. The secret room is absolutely delicious. I imagine that those librarians had quite a lot of fun showing you around and experiencing your delighted reaction to the creepy and the hidden. Every winter I chose at least a couple of series to either catch up on or start and finish. Yesterday, the Todds were here, and it so happens that catching up on the Ian Rutledge series is on my schedule for this winter. And, now, Mark is here, and Hugo is also on my series schedule this year. The Paris Librarian sounds like a read I will easily love, but I'll have to hold off on it until this winter. That is not going to be easy. Looking forward to seeing you at Bouchercon, Mark. I'm in the Houston area right now helping out with my brand new granddaughter. We're almost neighbors! I am a volunteer at my local library with a key that gives me access to most areas so I can relate to how easy it would be to use that for something wicked. I love reading this blog because it introduces me to so many fabulous series. I just finished The Wrong Girl by Hank, and Siracusa by Delia Ephron, and will put Mark's series on my list. Thank you, Jungle Reds for getting the word out about all these wonderful writers! Reading this post is my first introduction to your series, Mark -- hard to believe, but true. :-) Anything to do with libraries and secret rooms is right up my alley. What a lovely things for Michael's daughter to have her father's name included in a book posthumously. An homage. Rhys: you should definitely visit -- I recently heard from them, they are renovating the place and have discovered ANOTHER secret, a little room. Amazing, and lovely people working there. Ann: have you tried the Indian restaurant on Avenue Rapp? New Jawad... SO good! Kathy: Hugo will wait for you, don't worry! And yay, seeya in NOLA! For Dallas area readers, Mark will be signing at the Creekwalk Barnes & Noble in Plano on Saturday, September 3rd, at 4 p.m. I'm certainly hoping to make it! Thank you Mark for sharing the background events that helped shape the setting for your latest book. I'm looking forward to reading it. Whenever I travel I usually always make it a point to visit a library, and sometimes I spend an entire day poking around the collections. If I get back to Paris, the American Library will be on my to do list. What a touching tribute! This is the first I've heard of the book, but it's definitely getting added to my TBR pile. You've given me evil ideas Mark. Next time I am visiting some interesting historic place I'll try that "I'm writing a book. . ." and see if I can get a behind-the-scenes tour. I got behind on Hugo's adventures. 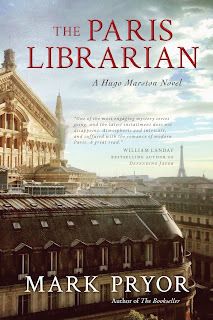 I need to read The Reluctant Matador before I enjoy The Paris Librarian. Two things to look forward to! Thank you so much for the endearing background to both threads in THE PARIS LIBRARIAN, Mark. I'm reading it now and enjoying it very much. Delighted to hear some of the backstory to a book (and a series) I thoroughly enjoyed. I think of these as the Hugo Marston stories. Sorry, Author, I can never remember your name! How fun to hear those back stories, very cool. Stephanie, that's incredible, I would have jumped all over that story too! And Susan, I'll forgive you as long as you keep reading the series! How could I not love The Paris Librarian. 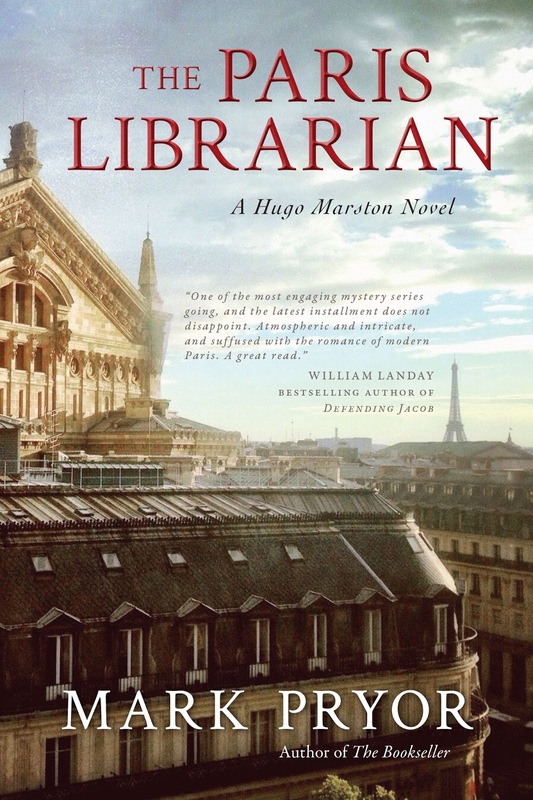 A book set in Paris featuring a librarian with a character named for a man with terminal cancer, a lover of the author's books. Made my day just to read this, Debs. Great blog today. Great guest in Mark Pryor. Lovely naming story (nice he at least got to choose his eternal position in the line-up). And the librarians were a hoot (well, in a librarian sort of way). Looking forward to it! Trick of language question: "yes" is not the answer I would have expected to your question, Mark Pryor-- do you mind if I murder someone in your library? I would expect "no, I don't mind." A "yes" answer to the do you mind question just doesn't make sense to me as permission to do the thing...although it seems to make sense to many others. Just wondering if anyone else shares my version/confusion. Will be putting The Paris Libraian on my to read list. Thank you for telling of your meeting Michael and making it possible for him to finish just one last book. Ah, Mark, you've done it again, making me like you even more. Funny you should say that about my dad taking his time with your last book. 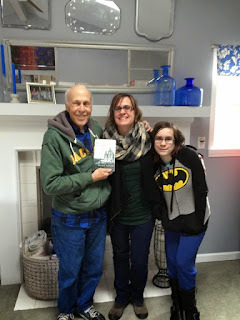 When Jill was kind enough to give me an ARC of The Paris Librarian, I took my time with it because my dad was there again for a short while. I didn't want it to end because I wanted to keep seeing his name and imagining how happy he'd be if he were reading it! 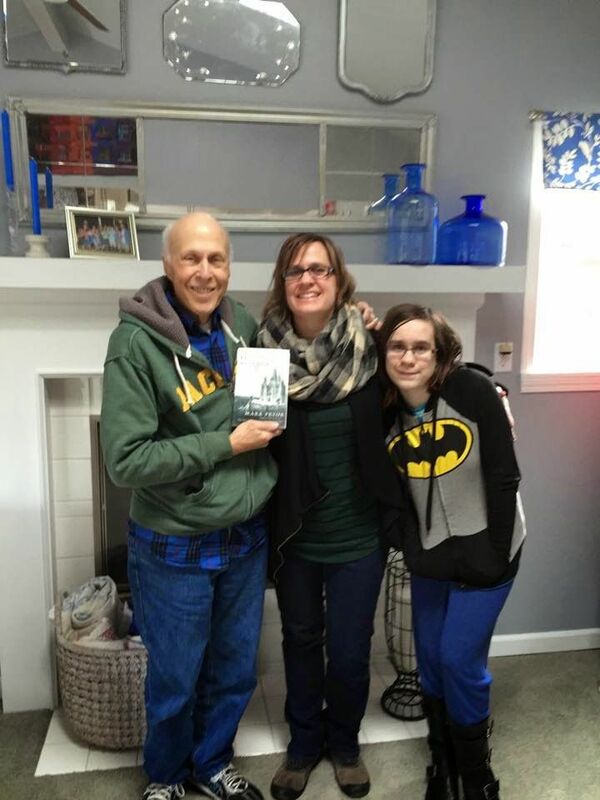 It's a fabulous book and we're so honored to see him memorialized in this way. Looking forward to buying you a drink (or two, or three...) in NOLA next month. Michael was my dad. To know Mark was putting him in his book made him very happy. For me, the act of sending my dad an ARC so he could read it before he died, makes Mark a hero. Being a bookseller, my sister got an ARC of the Paris Librarian. She texted my mom & our siblings a picture of the dedication Mark wrote. I was in the middle of a meeting & cried. Mark - I.m jealous my sister gets to meet & thank you in person. Please come to Northern California so the 3 of us here can take you to dinner. @scoutandralismom - just three drinks?? @Elizabeth - that sounds absolutely lovely, and I may even take you up on that offer. The Paris Librarian sounds terrific! How wonderful that you could send the ARC to Michael Harmuth before he died. I just learned about the Hugh Marston series from another book reviewer a couple of weeks ago. Hugo Marston sounds very interesting. Can I ask which of the High Marston books is the first book in the series? On another note, I just finished Light of Paris by Eleanor Brown. One of the characters works at the American Library during the 1920s. Look forward to reading The Paris Librarian. Hi Diana, looks like I need to pick up that book, then. :) The first Hugo book is called THE BOOKSELLER, the new one is number six in the series. If you get around to it, I hope you enjoy meeting Hugo!